NBC's America's Next Great Restaurant aired for the first time last spring as a series endeavoring to give budding restaurant entrepreneurs the chance to make their dreams a success. The show was hosted by celebrity chefs Bobby Flay, Curtis Stone, Lorena Garcia, and Chipotle founder Steve Ells. Over the course of nine episodes, the four celebs interviewed a diverse set of contestants and sampled their cuisine to narrow down which restaurant they would want to invest in. The winner was announced during the finale as Soul Daddy, a concept created by Jamawn Woods. His original concept was a restaurant themed around chicken and waffles, but it broadened to incorporate several styles of comforting "soul food." As the competition's first winner, Woods received three Soul Daddy chain restaurants in L.A., New York City, and Minneapolis. But last week marked the final moments for Soul Daddy. Unfortunately, the restaurants did not perform as well as both owner and investors had hoped, and all are now closed. In fact, the L.A. and NYC locations have been shut down for weeks now, in hopes that any leftover funds could help the Minneapolis Mall of America location succeed. The two restaurants were both closed on June 14. 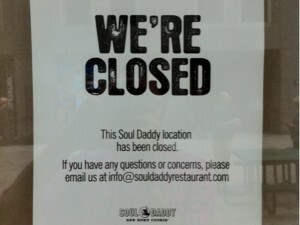 "This was a difficult decision for us, as we wanted to see Soul Daddy succeed, but the restaurant simply was not performing as we had hoped," the Soul Daddy team said in an official statement. "We'd like to thank all of the customers who tried our restaurants and the people who worked hard to try to make the restaurants succeed." NBC has also canceled future seasons of America's Next Great Restaurant due to poor ratings.